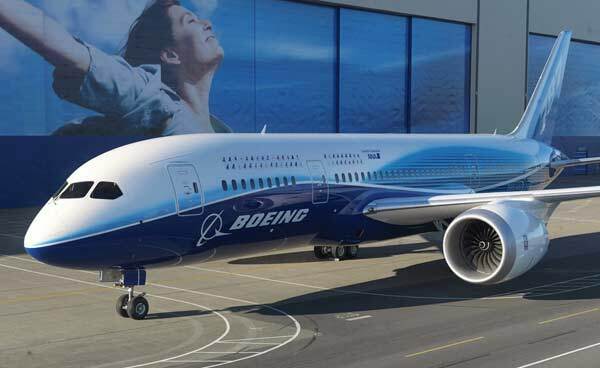 Model 787 is Boeing's newest aircraft type. It is a mid-size widebody aircraft for medium to long ranges and intended as the successor of the Boeing 767. It competes with the Airbus A330 and A350. In March 2001 Boeing presented the Sonic Cruiser, a futuristic looking widebody airliner with canard-wings, a delta wing, rear-mounted engines and two horizontal fins. The Sonic Cruiser was intended to fly at speeds close to Mach 1, that is 15 to 20 per cent faster than current jetliners do. The Sonic Cruiser offered accommodation to 200 to 250 passengers and could fly 11,100 to 16,650 km (6,000 to 9,000 nm) at an altitude of around 15,000 m (45,000 ft). Boeing had worked on the design since 1999. After the first sensation the airlines soon became less enthusiastic. There were uncertainties about the cost of the new technologies involved and about the relatively high fuel burn of flying at high speeds compared to what a new conventional airliner would use. After the terrorist assaults of September 11, 2001, most airlines were in a bad financial shape and lost interest in the Sonic Cruiser. In December 2002 Boeing shelved the project and focused its attention on a conventional-looking 250-seater, the 7E7. The E stood for 'Efficient' and Boeing's intention was to build a very fuel-efficient, silent and clean aircraft, with maximum use of new technology. The aircraft would become a replacement for the 767. Later the 7E7 was redesignated Boeing 787 and named 'Dreamliner'. 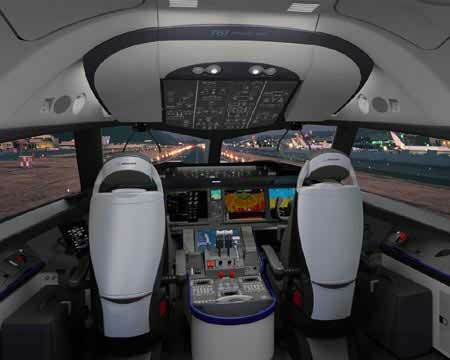 The Boeing 787 is an all-new airplane and Boeing has incorporated lots of new technology in the design. About 50 per cent of the primary structure, including the fuselage and wing, are built of composite materials, like carbon fibre reinforced plastics. For comparison: the Boeing 777 incorporates 12 per cent composites in the primary structure. The use of composites makes it possible to manufacture large one-piece fuselage sections, which eliminate thousands of aluminum sheets and ten-thousands of fasteners. The General Electric GEnx or Rolls-Royce Trent 1000 turbofans burn about 8 per cent less fuel than the engines of earlier widebody aircraft. So-called chevrons on the engine nacelles help to reduce noise. Another feature of the 787 are 'health-monitoring systems', which monitor the technical condition of the airplane and report maintenance information to computer systems on the ground. Boeing claims that these systems help to reduce maintenance costs by 30 per cent compared to current airliners. Passengers on the 787 enjoy windows which are larger than usual on today's airliners. Big parts of the Boeing 787, including fuselage sections and wings, are constructed by suppliers at sites far from Seattle. To fly these parts to the final assembly line Boeing developed a special version of the Boeing 747, the 747-400LCF (Large Cargo Freighter), named 'Dreamlifter'. The first flight of the Boeing 787 was initially scheduled for August 2007, but Boeing had to admit delays due to production problems several times. One problem was a shortage of fasteners in the industry and another complication was that sub-assemblies delivered by partners often were not complete so that a lot of unexpected extra work was necessary on the Everett production line. Boeing kept its original schedule for the roll-out on 8 July 2007 (“7-8-7”), but the first flight, which should have happened a few weeks later, took place after two-and-a-half years, on December 15, 2009. 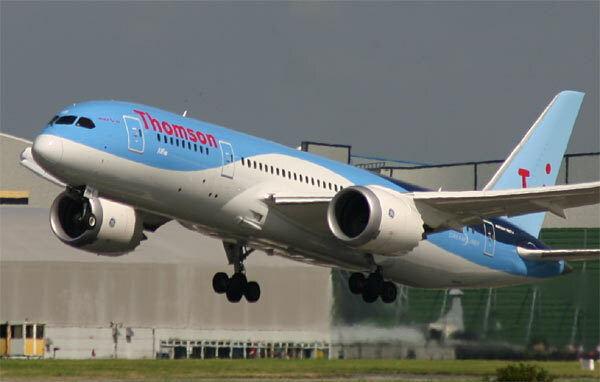 The US and European aviation authorities, FAA and EASA, certified the 787 on August 26, 2011. 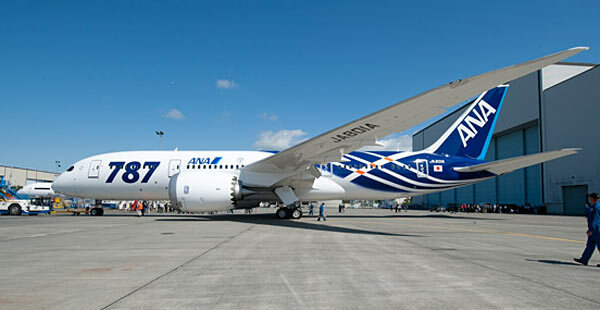 The first delivery to All Nippon Airways (ANA) was orignally planned for May 2008, but the first production Dreamliner was delivered on 26 September 2011. ANA performed the first commercial flight on 26 October 2011. After the introduction into service, problems went on. In January 2013 Boeing faced a grounding of the entire 787-fleet after a number of fires with the lithium-ion battery fires. Three months later, in April 2014, after a series of modifications, the Dreamliners was allowed to fly again. Boeing initially wanted to build three versions of the Dreamliner. The 787-8 for 210 to 250 passengers and a range of 15,200 km (8,200 nm), the stretched 787-9 seating 250 to 290 passengers and a range of up to 15,750 km (8,500 nm) and the 787-3 with 290-330 seats, optimized for much shorter flights of 4,650 up to 5,650 (2,500 to 3,050 nm). Because the airlines didn't show much interest in the latter version - JAL and ANA were the only customers - Boeing cancelled the 787-3. Plans for a 'double-stretch', the -10X, were canceled at first, because Boeing feared competition for the 777-200ER. Later Boeing revived the plan and launched the 787-10 at the Paris Air Show of 2013. The 787-10 is planned to make its first flight in 2017 and to enter service in in 2018. 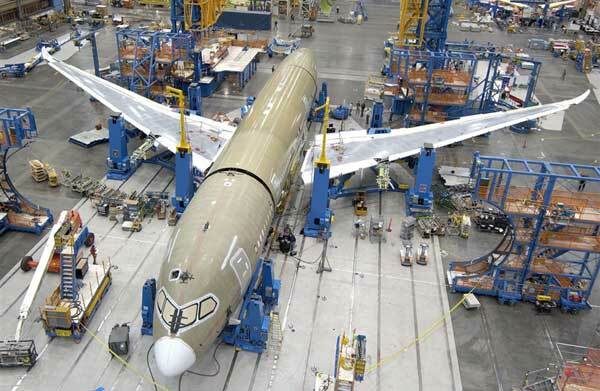 The birth of the second Dreamliner-version, the 787-9, went much smoother than of the 787-8. There were no big problems during the nine-month flight-test programme. The first 787-9 made its first flight from Everett on September 17, 2013. 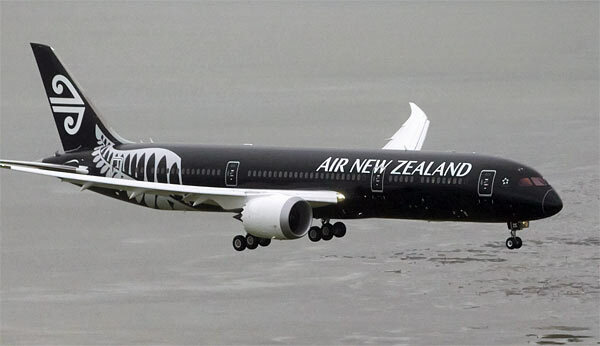 Certification was obtained on June 6, 2014, and the first delivery took place on July 9, 2014, to Air New Zealand. Other early users of this version are United Airlines and All Nippon Airways. The 787-9 has a longer fuselage which accommodates 40 more passengers than the 787-8, but also has an increaed range of 15,370km (8,300nm) after taking weight out of the aircraft and improve the aerodynamic characteristics of the airplane. A number of the improvements is put back on the 787-8. The 787-10 will be a rather simple stretch compared to the 787-9 and will add another 40 seats. It will have less range, however. The 787-10 is planned to make its first flight in 2017 and to enter service in 2018. In spite of all problems, the Boeing 787 had a spectacular sales start. Boeing received more orders for the type than for any of its airliners in such an early state of the program. At the moment of the orderbook comprised orders for more than 600 aircraft. Mid-2014 a total of around one thousand Dreamliners were ordered, including 486 787-8s and 413 787-9s. To increase production Boeing opened a second assembly line for the 787 in North Charleston (South Carolina), where labor unions are less powerful than in and around Seattle in the State of Washington.